Ethel Odesser Ousley was born in Patrick County, VA. on January 11, 1926. She was the youngest of ten children born to Richard and Clara White Griffith. In addition to her parents, she was preceded in death by her husband (of 34 years) Clevie Elmer Ousley, a daughter also Rachel Ousley Weddle and five sisters; Alice Griffith, Bertha Boyd, Florence McAlexander, and Dorothy Thomas. Five brothers; Denzer, Milford, Buran, Harley, and Leonard Griffith, step-son Barry Ousley. 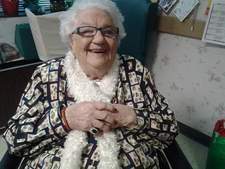 Ethel Ousley was retired from Basset Chair Co. where she gave seventeen years of loyal service to the upholstery dept., here, coworkers and friends alike knew her as “Mamma”. Indeed, she was a mamma to all those who loved and knew her as a tolerant, generous, kind, and forgiving friend. Surviving are two daughters and sons-in-law; Juanita and Dewey Shelton of Ridgeway and Mary and Robert Bolt of Bassett, one son and daughter-in-law Bobby and Mary Sue Ousley of Christiansburg and Daughter-in-law Sandy Ousley of Roanoke, seven grandchildren, fifteen great grandchildren, four great-great grandchildren, special niece: Marie Goad and numerous nieces and nephews and friends. The Celebration of life service for Ethel Odesser Griffith Ousley 92 of 3448 Dillion’s Fork Rd. Fieldale who passed away Thursday March 29, 2018 will be held Monday April 2,2018 at 11:00 AM at Gardner Funeral Home in Floyd, VA with Pastor Ricky Boyd and Pastor Mike Bond officiating, burial will follow in Cox Cemetery in Dugspur, VA. The family will receive friends one hour before the funeral from 10 to 11 at Gardner funeral home. In lieu of flowers donations may be made to Brenners Children Hospital, Winston-Salem, NC in honor of Annaleigh Gammons.